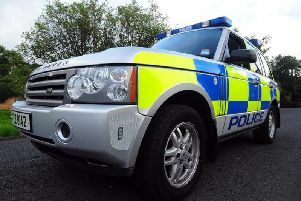 A motorist who drove over telegraph poles after turning into a driveway to avoid police, has been given a three-month jail sentence suspended for two years at East Tyrone Magistrates Court. Catherine McElkenny (46), of Derryloughran Road, Coalisland, was also fined a total of £400 and disqualified from driving for two years for driving with excess alcohol, having no insurance, no Vehicle Test Certificate and fraudulent use of registration plates. The court heard the offences came to light after the defendant’s car sped off when a police patrol came across it sitting at a junction on the Annaghbeg Road and headed towards the M1. Prosecuting counsel said about 70 seconds later the defendant turned into a driveway and her vehicle became stuck in a number of telegraph poles. He said there were two passengers with the defendant, who provided a preliminary breath test which showed an alcohol reading of 40mg. She was arrested and later provided a blood specimen with a reading of 91mls. A defence lawyer said McElkenny had bought the car the previous week for £300 and the plates came with the vehicle. He said she regretted being before the court and pleaded for leniency in respect of her early plea. District Judge John Meehan told McElkenny she had got into debt to get a vehicle and took it on to the road with no regard for the suffering she could have caused others.